With 11+ shawls finished, the womenfolk of the family are taken care of. For the menfolk I've started knitting a few "man" things. For my stepdad and 1yo. nephew I knitted Ziggy beanies. This is a recent release from Australian designer, Georgie Hallam also known as Tikki, who you probably know from such hits as the Milo vest and the Rainbow dress. Tikki's patterns are always fun, there's usually a little bit of quirk in the construction while still being great 'wearable' items. The ziggy beanie is part of a larger set that includes a skirt, vest, legwarmers and sweater that all use a fun zig zag cabled pattern to add a bit of zing to your knitting. Quite addictive I must say. I knit my stepdad's one first while on holiday in Golden Bay. The yarn is from Red Riding Hood yarns and is simply gorgeous. The DK was nice and soft and had lovely stitch definition (which is an important consideration for this pattern if you want nice sharp cable lines), but the colour....oh the colour. For "brown" it is simply gorgeous. Lovely subtle changes and really rich and deep. Just lovely. This was my first time knitting with RRHY and I was really impressed with the colours I received as part of my petite set (5 x 55g mini skeins). Isn't this a cool idea? Instead of getting just one colour, you get to sample a few. Photo from Red Riding Hood Yarns - "Paris Je T'Aime" Petite Set. Hannah packages her yarn in red paper, with red ribbon and lovely little RRHY tags. It makes it all the more special when so much care is taken with the presentation. Hannah sells her yarn via facebook with weekly updates and sometimes has custom spots available too on her blog. I'll definitely be knitting with RRHY again. I made my stepdad's one in the dark brown (far right) with a rib band from the milk chocolate skein (far left) as I was worried I might run out of yarn and I didn't want to play yardage chicken with my holiday knitting. Of course, you know what happened - I had some leftover! The toddler size one is made from the rest of the light brown skein. The little blue hat I made my nephew last christmas no longer fits so this is a more grown up replacement. Such a fun knit, it only took a couple of nights. I must say after a year of knitting 4ply shawls, it has been great to do some quick DK knits. After my Ziggys were finished I had a 10g ball of each colour leftover. The wool was simply too nice to throw in my odds&ends bag, so I decided to use every bit of the loveliness up. When I saw this pattern in the latest knitty.com issue I just knew I had to make one. My leftover brown yarns were perfect (I striped them), finish it off with some black and white scraps, some black felt for eyes and you have a cute little kiwi! He's only 10cm high so as you can imagine took almost no time at all to make. In amongst all my lofty shawl making goals, my test knitting and xmas to-do list, it was pretty satisfying to make something 'just because'. ...a great place to visit is the Ti Point Reptile Park. We met some friends there during the last few days of the holidays and had a lovely family day out exploring the Matakana area. The park itself is about an hr north of Auckland and 20min from Warkworth. We were very pleasantly surprised by the range of animals the park takes care of - from skinks and geckos, to tortoises and turtles, alligators and lizards and tuataras. It's set in gorgeous bush with views out to the coast with enclosures spread out all over the park. I think my favourite were the chameleons. This one was on a branch right next to the glass which meant I got a couple of good photos up close. Their eyes are totally creepy- they can independently rotate so potentially the chameleon has a 360 degree view. And such bright skins, so fascinating! The park has a range of tortoises (land based) and turtles (water based). I never realized how much variation in size and colour there were between species. This doesn't really capture his size very well, but this enclosure houses a Galapagos Tortoise. He is HUGE. Like a giant slow moving rock. Very cool. Afterward we drove down to the Goat Island Marine Reserve which was another stunning piece of NZ coastline. We easily could have spent a week there exploring. DH couldn't stop talking about the massive snapper swimming around in the glass-like water. The kids played in the sand and the rock pool area while our friends went snorkelling. Next time we visit we will have to take a ride in the glass bottom boat that does trips around the island. We packed so much fun into our holidays, I was quite sad when they (too quickly) came to an end. Now we're heading into term 4 already - where has the year gone! If you've been reading here, you will know I have been on a bit of shawl kick this year. I never really thought I would ever knit shawls - they always appeared too difficult, too fiddly, too time consuming, but I have really enjoyed my foray into shawl knitting this year. I think part of the appeal is the lack of finishing. Sew in your ends, give it a good block and that's it. There's no sewing on buttons or zips, dreaded seaming, or having to worry about sizing. They're also perfect for that one skein of special yarn - no worrying about having enough yardage, matching dyelots etc. I will confess that while I might be a keen shawl knitter, I am not always as enthusiastic about wearing them. I have made a few for gifts this year, some I kept for myself. Some I wear tons, some I will probably never wear, one is going to be kept for special occasions. However, I am a firm believer that sometimes the knitting is about the process rather than the product. Back in 2009 I made good progress on knitting a whole bunch of sweaters for myself - and I don't wear most of those very often either. I think knitting so many shawls this year has definitely helped me work out what I'm likely to wear, and what I'm likely to just keep to admire, or simply knit for the experience and challenge. My 11 shawls in 2011 was definitely about challenging my skills, and trying new techniques and constructions. I learnt so much, and it was a good opportunity to knit some things for myself, and to knit a few gifts too. Favourite? Easily the Rock Island. It is just so lovely. It was a great challenge for my knitting skills and I learnt so much. The yarn and pattern were a match made in heaven and I can't wait to wear this somewhere special one day. I really wanted to knit at least one lace weight shawl this year and I'm so pleased with how this turned out. Most worn? My hitchhiker. Made in super soft bamboo from Tri'Coterie it is so lovely to wear and is a great length to wear scarf style. I also really enjoy the knitting of this pattern, and made a second one to gift to my sister for Christmas. I wanted to try a few different construction techniques - Hitchhiker is knit on the bias, Pettine is knit side-ways, Rock Island is bottom up, Eiki is top down and the Xi shawl makes use of short rows to give a construction that is really unique. I also had a go at stripes with the Sencillo shawl and the Pix shawl. I also designed a shawlette. Faultline was released in September, in remembrance of the earthquakes in Christchurch. Two of the shawls - Rock Island and the Pix shawl - are over 500m. The others are mainly one skein of sock yarn shawls (so from 320m to about 400m). I got to sample a great range of yarns too - including merino/cashmere/nylon (MCN), merino/silk, bamboo, organic cotton, sparkle lace weight silk/merino, and tightly plied merino. I have to do a plug here for yarns. Firstly, Tri'Coterie of course. Not just because I'm an honorary staff member/helper but because the range of yarns are just so lovely and luxurious. I'm lucky to have had a chance to sample so many decadent bases this year. The Rock Island, Xi, Elena, both Hitchhikers and my orange Faultline are all Tri'Coterie yarns. Maylin has a great eye for colour and offers some fairly labour intensive colourway options (gradients, stripes etc) that are usually fairly hard to get a hold of from indie dyers. We have a group on Ravelry if you want to come see what's on offer this month. And also, my favourite NZ yarn - Fibre Alive from JOY. I used the Merino Mania (4ply) three times in this challenge, including using it for my own design. The colours are rich and deep, and the tightly plied merino looks especially nice in garter stitch in my opinion. The Elena shawl, the Xi, and Pix were all test knits, and it was fun to knit something "new", helping out others and learning what works for my own pattern writing. Holidays in our favourite spot in Golden Bay. Beautiful weather, such a nice change from the wind and rain that has greeted us since we have been home again. Quite a bit further to travel now, but so worth it. Family, friends and lots of fun. Shopping, beaching, partying, lazing about, knitting and bbqs. I *almost* met up with Miss Smith - maybe next time! I am already looking forward to next year's trip. Rock Island was one of those patterns where I saw it, loved it, then decided there was no way I could knit that. 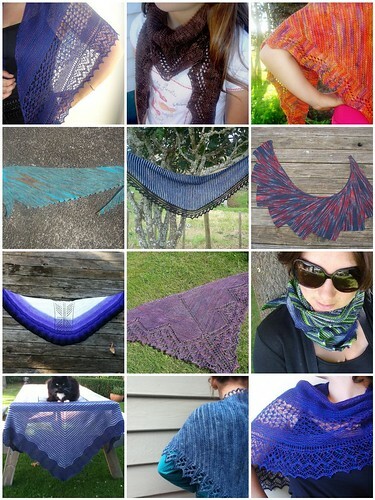 The mere thought of knitting a laceweight shawl from the bottom up was just too intimidating. But you know what? I did knit it. I will admit that the knitting was reasonably challenging. My first time using lace weight yarn. My first time knitting lace where there are no rest rows - concentration plus! My first time deciding that perhaps this lifeline business is worth investigating, I tried it, needed it, and will definitely use it again if I am ever crazy enough to knit another one of these. Despite the step up in difficulty, it was a fun challenge to do a brand- new-to-me construction. The yarn is total luxury. Merino with silk and just a hint of sparkle. It is warm and airy at the same time, reasonably bulky for a lace weight, but still gives a FO that is lightweight and dreamy. I used a little over 500m of laceweight. Enough to make a huge shawl, one of my biggest this year, and enough to complete my 11 shawls in 2011 challenge. Yep. I've knit 11 shawls this year (a post on that later in the week). It doesn't seem that many! This one gets my "most proud of" award. So much learnt, and the FO is simply gorgeous. My crappy camera does not do this yarn or this colour justice. It really is just lovely and so soft and warm to wear. I am really quite thrilled with it and keep picking it up to admire. Is there anything that makes a knitter more happy than a yarn and pattern match made in heaven?